This post is sponsored by Dreamfields, healthy pasta that tastes like regular pasta! After creating (and eating) 100+ Italian inspired recipes for my upcoming cookbook, I promised BL that we would take a pasta break for the month of January. A pledge to create more of his favorite foods, like tacos, salads and stir-fry and take a break from our almost nightly pasta routine. Ha. Um, no. In all sincerity, when I told him OK back in December, I honestly thought I could do it. But then temperatures crept into the single digits last week and all I wanted was a simple bowl of hearty pasta topped with a spicy tomato sauce. If you’re looking for a quick and easy weeknight dinner, this is it. 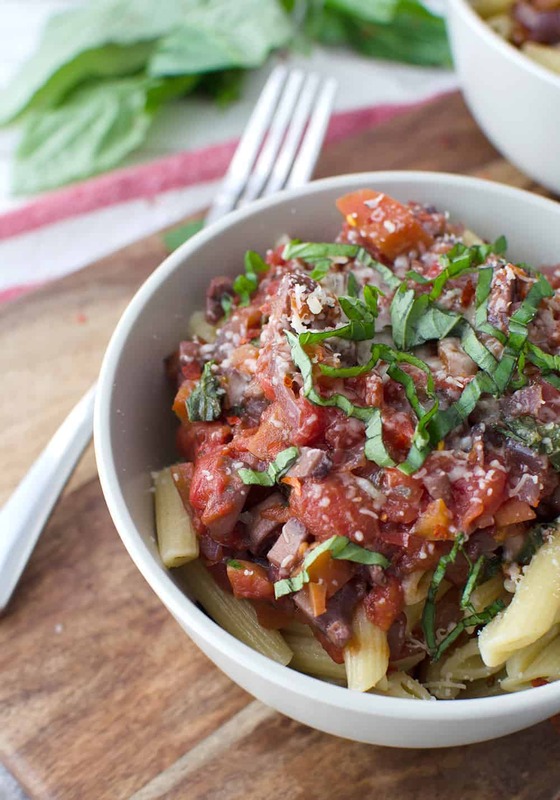 Spicy penne with a few servings of vegetables that comes together in less than 30 minutes. Since it’s the second week of January, I’m betting that most of you are focused on eating healthy. While I don’t believe in making unrealistic resolutions, I completely understand the feeling of wanting to get back on track after an indulgent holiday season. Or maybe that’s just me. Considering my New Zealand holiday diet consisted of wine, cheese and more wine, I’m now craving simple and nourishing. What I love most about this dinner option is that it’s both crave-worthy and filling. A single 350 calorie serving contains 10g of fiber and 12g of protein; two satiating nutrients that will keep you satisfied for hours. When it comes to healthy eating, I teach my clients to aim for satisfaction, not fullness. Since I subscribe to the happy weight philosophy of dieting, I know that food not only has to be nutrient rich, it also has to taste good. Since pasta is one of my favorite foods, I make sure I can have it often by adding in nutrient-dense vegetables to up my intake of extra vitamins, minerals and fiber. Lastly, let’s chat about serving size. It’s the other piece to the “all foods fit” concept; a slice of bread is fine, a loaf is probably too much. This is true with all the foods you love (pasta included). In fact, the more satisfied you are with your meal, the less likely you are to overeat. I know that’s true for me; when I savor my meal, not only do I enjoy it more but I often end up eating less than I planned on. This observation was my first “aha” moment into giving up calorie counting forever and getting into Mindful Eating. When I don’t obsess over the numbers, it’s easier to find a weight I’m happy with. This meal is my ultimate win. It’s exactly what I crave on most days with enough protein, fiber and vegetables to keep both my hunger and appetite satisfied for hours. I hope you enjoy it as much as I do. 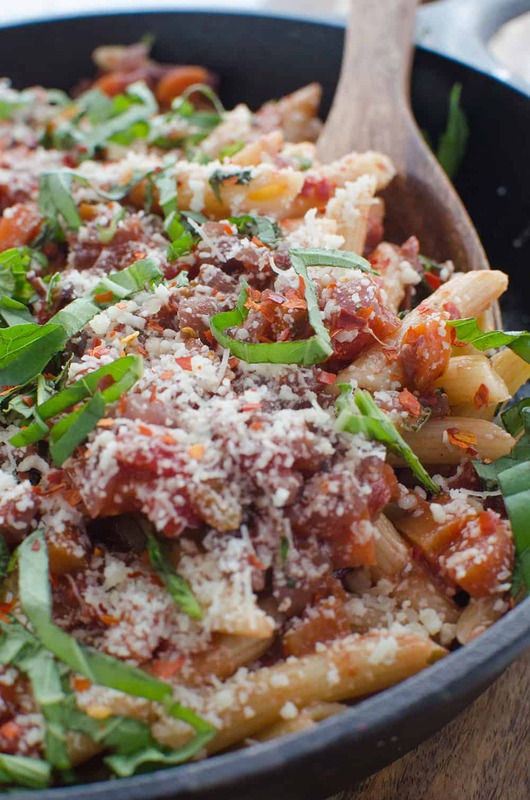 Spicy Penne, the BEST weeknight pasta! 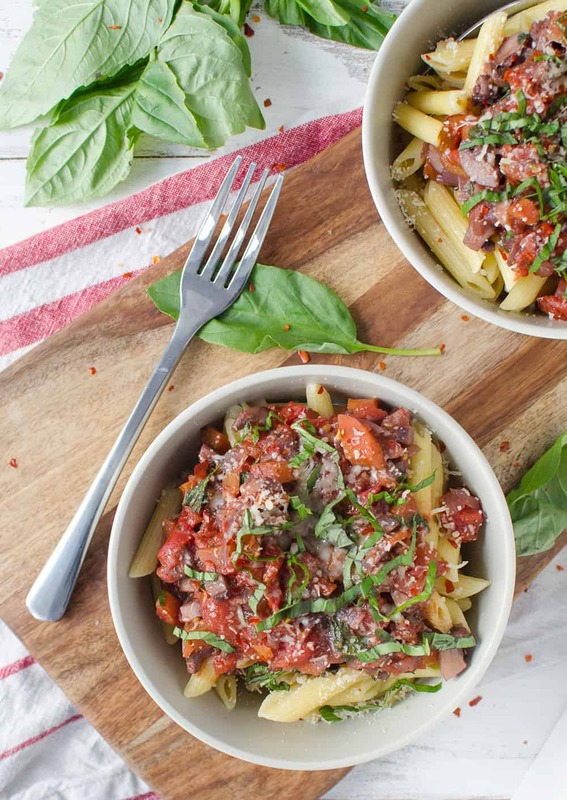 You’ve gotta try this vegetarian pasta. Spicy vegetable marinara over dreamfields pasta. Cook pasta according to package directions. Reserve 1/2 cup cooking liquid before draining; set aside. Meanwhile, heat olive oil in large skillet over medium heat until hot. Add onion, carrots and mushrooms; cook 8 to 10 minutes or until vegetables are soft. Add salt, oregano, red pepper flakes and pepper. Stir in wine; cook about 5 to 8 minutes or until liquid is reduced by half, scraping up any browned vegetable bits on bottom of pan. Crush tomatoes with hands and add them along with juice to skillet. Simmer 10 minutes, stirring often. Remove skillet from heat. Add cooked pasta and 1/4 cup of the reserved cooking liquid, the Parmesan cheese and basil; toss to combine. If sauce is too thick, thin with a little more of reserved cooking liquid. Transfer to large serving dish. Garnish with additional Parmesan cheese and basil, if desired. Let’s eat pasta! I’m giving away a case of Dreamfields pasta to one DK reader! Enter below, I’ll announce the winner next week. My go-to meal is spaghetti with meatballs which I have previously frozen. So excited for your cookbook 🙂 I’ve never had Dreamfields pasta before- hopefully I win! I hope you do too! It’s AWESOME. It seriously tastes just like white pasta, but has enough fiber and protein to act like whole wheat. Everyone’s happy when I make baked mac and cheese! We like burrito bowls around here! We like Spaghetti with meatballs. My go to weeknight meal are tacos! We love making lentil walnut “meat” tacos with all the fixings! Yum- me too! We just had lentil tacos last night! My go-to weeknight meal is any variety of pasta. So versatile and easy to make. My go to weeknight meal is actually Brinner, you know breakfast at dinner! Right now we can’t get enough, whether its pancakes, French toast or waffles! I love that- we don’t do brinner enough! This might make it onto my table tonight! My current go-to dinner is a burrito bowl — beans and rice from batch cooking with copious amounts of salsa and avocado! Yum! That sounds like one of my favorite dinners as well! 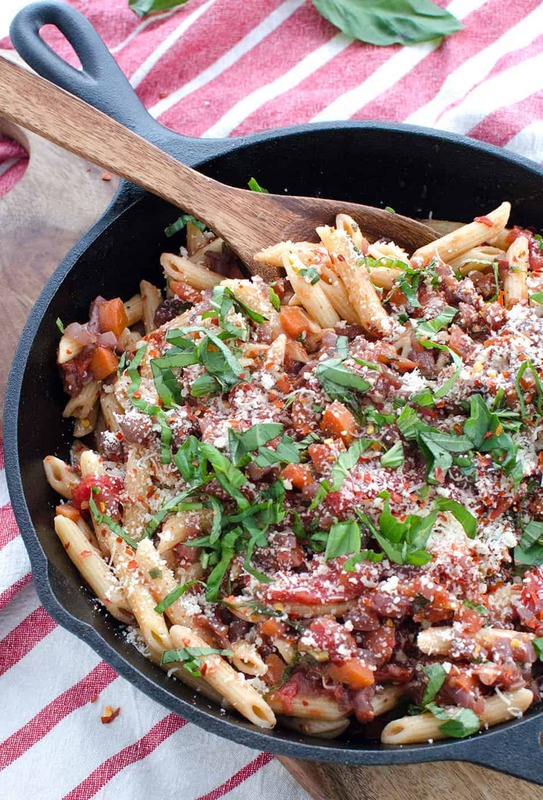 My go-to weeknight meal is anything that goes into one pot. I really enjoy making sweet potato hash – it’s healthy, easy, and a complete meal. That sounds great, I need to make that. Red Flannel Hash is on my “to make” list for the winter, love the idea of a sweet potato hash! Spaghetti is always easy and good. I love any kind of pasta! Yours looks fantastic! 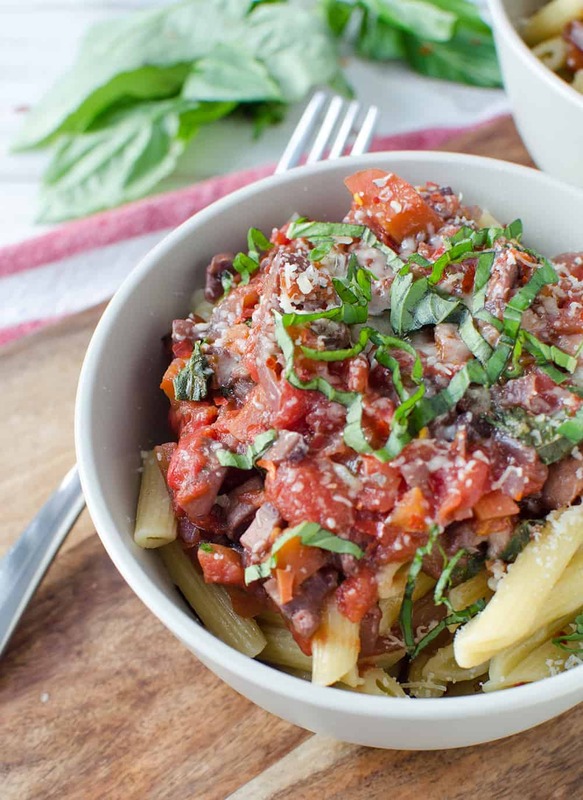 I think Penne is my favorite of all pasta shapes, and I agree that a simple pasta dinner can be so satisfying! Looks delicious! Thanks Meghan- I’m with you! Me too Terry! It’s one of my go-to recipes! We usually like to make a garlic pasta or a quick flatbread “pizza” and salad! Roast chicken..easy and delicious is my go to! When we haven’t planned something else, we always go to a casserole. You just grab a meat from the freezer and some fillers from the cupboard, and you are all set. Pasta or tofu stir fry is my go to meal. Mine is home made mac and cheese. A simple yet yummy omelet! My go-to meal is a vegetarian taco casserole. Spaghetti comes to mind first. Thanks for the chance!